The village of Asira al Qibliya again came under attack by settlers from the nearby illegal, Israeli settlement of Yitzhar on Friday 16h May. 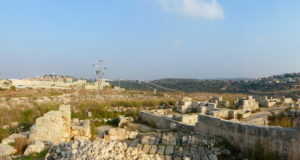 Residents of the village, located 3km south of Nablus, report that at approximately 2pm on Friday, one adult Israeli settler entered the lands of the village, and began throwing stones at the houses nearest the top of Mount Salman, where the illegal settlement is located. After fifteen minutes, he was reportedly joined by another 30 adult settlers, some armed with M16 machine guns and handguns, all throwing stones at the villagers’ houses. 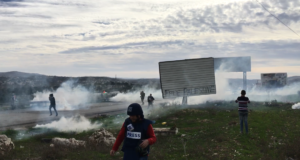 When approximately ten of the villagers went to confront the settlers, up to 15 Israeli military jeeps arrived and began to fire tear gas and rubber bullets at the villagers. Residents of the village report that the Israeli soldiers stood by as the settlers threw rocks and tried to set fire to the village wheat fields – some arguing that soldiers were seen to be instructing the settlers to do so. 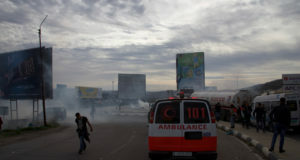 One villager reported standing near the village electricity pylon and witnessing shots fired towards the pylon – a frequent tactic employed by the Israeli army when invading Palestinian villages. One resident was injured when a rubber bullet ricocheted off his roof and hit him in the chin. Israeli soldiers reportedly threw tear gas into the home of Jamal Yousef Saleh Ahmad, an illegal act under Israeli law, while his wife and four children under ten years old, including a two-month old baby, were inside. Soldiers also shot holes in the family’s water-tank – the second time in two weeks. Jamal’s house regularly comes under attack from Israeli soldiers and settlers, because of its location high up on the mountain – attacks that are unhindered by the phone calls that Jamal’s wife, Nahla Machmoud, makes to the Israeli army District Coordinating Office (DCO) every time her home and family are assailed. Residents also report that one donkey was stolen by the settlers, and has not been returned. Israeli soldiers finally left the village at 7pm, but residents were afraid they would return during the night. For the past six weeks, Israeli soldiers have been regularly occupying families’ homes in the village – for four weeks as often as every night, now at least twice a week. Residents report that soldiers arrive at 1am and force all of the family members into one room (a practice illegal under Israeli law), and stay in the home until 6am. Reports of thefts by the soldiers are common. Villagers claim to often know which home will be targeted by the soldiers, as jeeps will often come during the day and park by a particular house for 30 minutes. This will be the house that is later occupied.